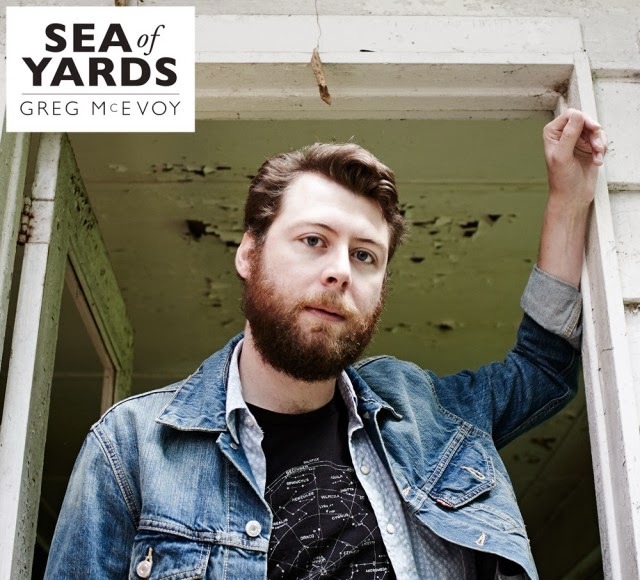 Rock Review Phil: Greg McEvoy "Sea Of Yards"
Greg McEvoy "Sea Of Yards"
About a month ago, my cousin asked me if I was interested in catching a band that she enjoys at a bar in downtown Toronto close to where she lives. The band was recently Juno nominated folk group Strumbellas, whom I had never heard of before that point, but the ticket was cost me nothing and I trust this cousin’s taste in music, plus she needed someone to go with so I figured I’d come to the rescue, and I ended up having a hell of a night at this sold out show in a small bar on a snowy night. Not only did I discover the uniqueness that is Strumbellas music/live performance, but I also had the pleasure of discovering two other local artists who opened for them that night; one of them being the country rock infused Sarah Cripps and the other being soft indie rocker Greg McEvoy. I thoroughly enjoyed all three artists and was pleased to have left with albums by all three. Greg McEvoy’s EP Sea of Yards was among the albums I left with that night. I was very impressed with his band’s live sound, and I figured if he could put that sound on record, it would make for a great purchase, and frankly I was right. It isn’t the easiest to categorize Greg’s music; nowadays I guess indie rock is the way to describe it, but there is also some country and soft rock influence to the music. The album can be found on his Bandcamp page. Opening track Someone Who’s Around is a slow and steady track, with vocal harmonies that immediately grab the listener’s attention instantly, as well as a surprising amount of guitars being played, mostly rhythm guitars but there is the occasional lead guitar fill that just seems to fit. The second track, The Words In My Head infuses a bit of country into its sound. The song isn’t as slow as the opener, and it doesn’t have as noticeable vocal harmonies to it, but despite that, the vocal performance Greg puts forth is more memorable than Someone Who’s Around. Alone in the Fire has heavy use of acoustic guitars; in fact no drums are heard until almost two minutes in. This just further exemplifies the writing capabilities of Greg McEvoy, who by this point on the EP hasn’t really recorded the same song twice. Even though the track Fear & Love is also heavily acoustic based, the songs other instruments, such as piano and bass guitar are more apparent, and when the music picks up on this track, it hits you a bit harder than Alone in the Fire. This trend is continued with Forever. Though by this point, we have figured that Greg’s specialty in writing and recording is in slower tempo songs. Forever is the slowest paced track on the album. I’m no dancer, but I can see a waltz being danced to this songs pace. I think I’d have to say that Greg’s vocals on Forever are my favourite on the entire EP. The most high tempo song on Sea of Yards is All This Time. The song has the fastest drum beat, and just sounds all around happier than previous tracks. I’m not saying the album is really all that melancholy, it really isn’t at all, but All This Time seems to give even more life to the EP. It’s just unfortunate that it is the shortest song on the album. The EP ends with one more acoustic track, Kerouac. Unlike the previous acoustic songs, I feel there is more emotion put forward on this track. I don’t know if anyone else would agree, but it’s how I feel about the song, and it makes for a good closer to the EP. Given the soft nature of the EP, ending Sea of Yards with an acoustic song (this one doesn’t pick up at the end, unlike the previous to acoustic songs) to be a fitting choice. Again, Sea of Yards is hard to really categorize. I think of it as soft rock, and soft rock that I really enjoy. I like the somewhat poetic and well thought lyrics, and for the most there is some spectacularly composed music to glue everything together. I don’t know if it’s original, I mean I don’t know who would agree with the EP being original, but it sure is unlike much music that I’ve heard, making me appreciate what I feel is some good originality. I don’t say this often enough about the independent artists I review, even though this applies to quite a few, but I look forward to future music released by Greg McEvoy. I just hope for more tracks like All This Time the next time around. “Someone Who’s Around” –­ I don’t know if there’s a track that can truly sum up the album, and I definitely haven’t narrowed down a favourite song yet, but I feel that for first time listeners of Greg’s music will get a good idea of what he is about upon hearing this opening track to Sea of Yards. Step Echo "Songs for the Broken"
The Mouth of Ghosts "You Will Go Again From Me"